As the saying goes… A picture is worth a thousand words. Post this picture on your refrigerator or somewhere in the kitchen to remind yourself…ITS ALL ABOUT THE FOOD! 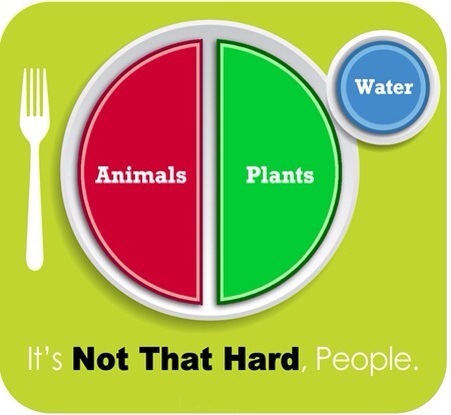 If you need to loose some weight keep it simple…fix your plate according to the picture. For those of you already nice and trim…fix your plate the same to stay nice a lean. Lot of fruits and veggies onto the plate. This is where our vitamins and minerals come from. Fruits and veggies will help you loose weight and help boost the immune system. Our bodies need this! Exercise! This has to be done…. Move that body! The more you move it the better you will feel. If you’ll eat a better diet you will have more energy to exercise. Let’s start today… You can change! Keep the picture with you and just do it! Good Luck and as always message me with any questions. If I don’t know the answer I can find the answer through my professional network. This entry was posted in articles and tagged exercise, fast food, fruits and veggies, healthy diet, movement, processed foods, water. Bookmark the permalink.